The good news is that the Patriots won the game 21-13 against the Los Angeles Chargers and improved to 6-2 heading into the bye. And the team has to like where they are at considering the slow start the team got off to at the beginning of the year. And while this one once again went down to the last possession with the Chargers, although Jonathan Jones came away with a game-saving interception, the Patriots defense played just fine. The offense, while moving the ball very effectively against a stout Chargers defense, couldn’t finish drives and came away empty or with a field goal far too many times. The Patriots were just 1-4 in the red zone and coupled with two Stephen Gostkowski missed field goals, this one could have easily been in the very comfortable to the blowout mode if the offense just finished off a drive or two more. Tom Brady after the game in his presser spoke about the lack of execution in finishing drives and said much the same thing. They let the Chargers hang around far too long and it is an issue that the team will have to self-scout during the bye week and work on. But give the Chargers defense a lot of credit. They were playing the classic Patriots style of allowing the opponent to move between the 20s and then stiffening in the red zone. And they hung in there long enough to give their team a chance to send it to overtime. Brady finished 32 of 47 for 333 yards and a touchdown. He was shredding the Chargers underneath to the running backs. It was this and the act of taking shorter drops which had a lot to do with their success. Nate Solder played easily his best game of the season, protecting Brady from Joey Bosa on the edge. Marcus Cannon re-injured his ankle and was replaced quite ably by LaAdrian Waddle. The short drops allowed Brady to stand up in the pocket and give Solder and Waddle the advantage of pushing their pass rushers to the outside. The interior of the offensive line did a very good job of keeping pressure off of Brady as well. 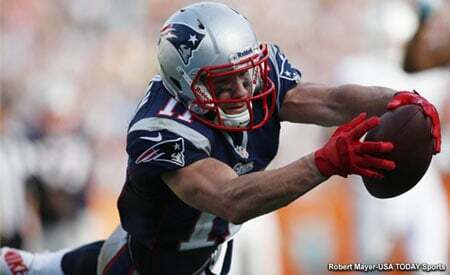 Targeting the running backs, Brady completed 14 of 15 for 163 yards. James White caught five passes on six targets for 85 yards, consistently reaching the sticks and keeping drives alive. Rex Burkhead caught five passes for 68 yards and Dion Lewis had two catches for 10 yards. One surprise area was the running game, the Chargers came in allowing over 140 yards per game, but overall did an outstanding job of filling the gaps and limiting the Pats trying to consistently find room to run. Last week they held Denver to just 69 yards, the Patriots ran for just 97 on 32 carries, a 3.0 yards per rush average. That’s good defense and shows last week was no fluke, that they’ve fixed their issue. Dion Lewis continues to be the team’s main back in the running game although the main four backs all saw time getting snaps. Los Angeles got on the board first, Melvin Gordon took the ball out to the right side and the Chargers got a tremendous seal on Cassius Marsh, pushing him far to the inside. The center flew out and cut Elandon Roberts in the middle. Gordon cut back into the gap and the secondary members took poor angles and Gordon raced 87 yards for a touchdown. That was more than they were averaging for an entire game. But after that play, the Patriots run defense held the Chargers to just 70 yards on 20 carries for the remainder of the game. The Patriots answered that with a touchdown drive of their own, going 77 yards on 14 plays and eating up six minutes and 19 seconds of the game clock. After Chris Hogan picked up a key first down on third and four down to the two-yard line, Brady made a nice play action fake and found Rob Gronkowski all alone for an easy score. Outside, Chris Hogan had five catches for 60 yards but left with what looks like a serious arm injury. Gronkowski, despite being held on what seems every down, had five catches for 57 yards and the score, Brandin Cooks had five catches for 26 yards and Danny Amendola had two catches. Rookie tight end Jacob Hollister had one catch for 13 yards. Philip Rivers completed 17-30 for 212 yards with a touchdown and an interception. With the weird sack that the Patriots got when Rivers dropped the ball and lost 20 yards, so his net passing yardage was 192. He got the one touchdown when they put together a good drive after a Patriots missed field goal attempt and went down the field in just four plays. On first down, they got a 30-yard penalty on Jonathan Bademosi which put the ball at the Patriots 37 yard line. Three plays later, Rivers quick-snapped the ball before the defense was set and he delivered a perfect throw to Travis Benjamin who beat Malcolm Butler to the corner of the end zone. David Harris played a lot more than he had in the previous seven-game and the Patriots used him and Elandon Roberts on A-gap blitzes much more than they’ve done so far this season. Kyle Van Noy moved more outside for this one and appeared to take on the Hightower role, complete with the green dot, for the defender making the calls on the field. While this one wasn’t as clean as they’d like, the bottom line is they held the Chargers to just 13 points and did it while missing four key players on their defense. They took care of business at home and still control the division and enter the bye a very solid 6-2. 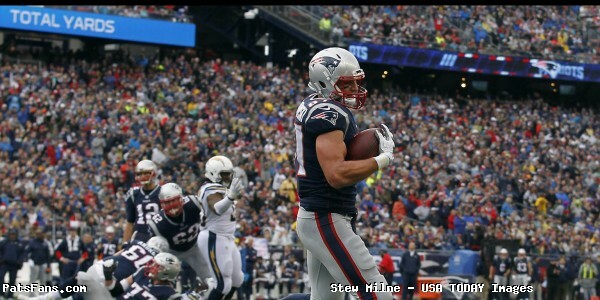 This entry was posted in 2017 Patriots Season, NFL Commentary, Patriots Commentary, Patriots News and tagged 2017 Patriots Season, Bill Belichick, Chris Hogan, Danny Amendola, Dion Lewis, James White, Joey Bosa, Los Angeles Chargers, Melvin Gordon, New England Patriots, NFL, Patriots, Philip Rivers, Rob Gronkowski, Tom Brady, Travis Benjamin, Trey Flowers on October 29, 2017 by Steve Balestrieri.